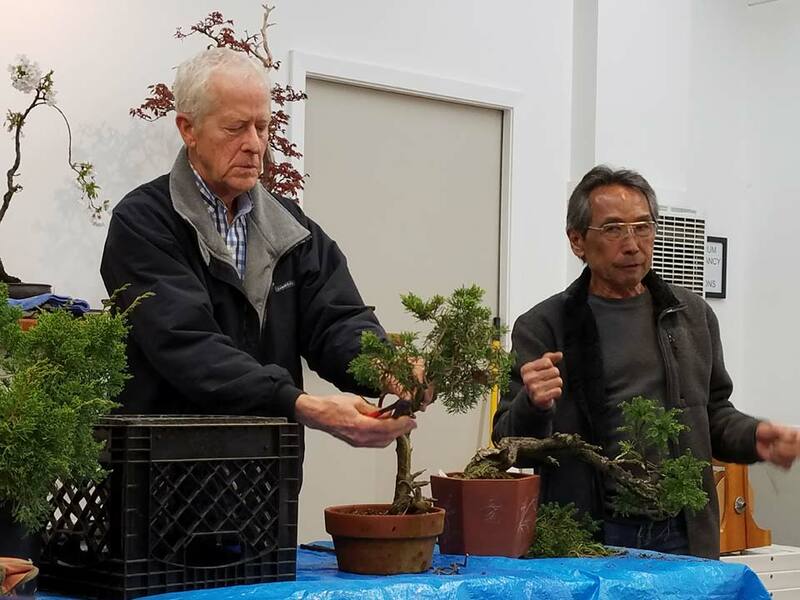 On March 7th, our own Chris Ross was joined by our former club sensei and current member of BSSF, Tim Kong, to give us a demonstration on how to style our junipers. In particular, Chris focused on knowing when you can do what with your trees, and how to quickly impart as much age as possible in younger trees. Tim provided alternative perspectives, often discussing how he bucks many trends, and gave many tips on how to remain frugal when enjoying what can often be an expensive hobby. Chris and Tim brought three trees between them. 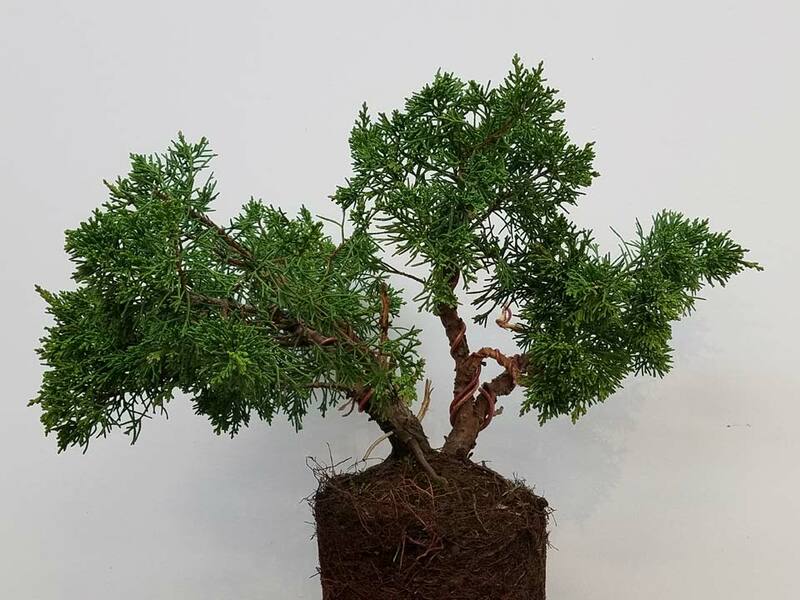 Chris brought a nursery shimpaku juniper that he and John Doig have been maintaining for at least a year and a half. Tim brought two older junipers of more common varieties from the inherited section of his own collection, including a nice cascade with lots of potential deadwood. 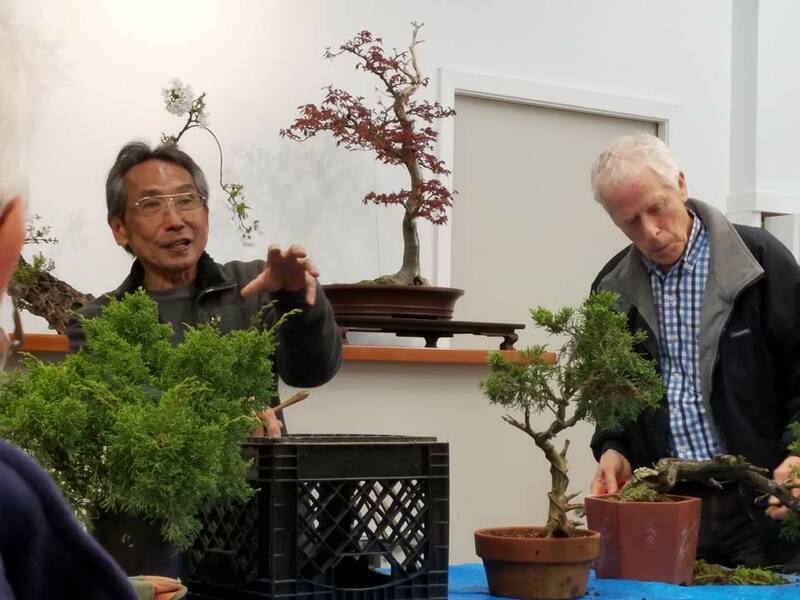 Chris did a lot to the young shimpaku throughout the demo, including extensive pruning and wiring, but Tim’s trees only had their latest wire removed from them. 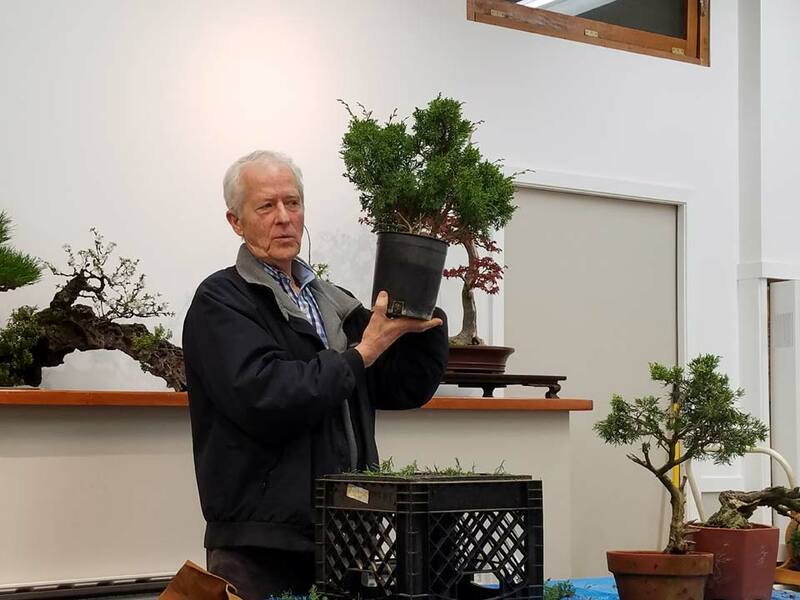 Tim primarily used his trees as a focal point for his comments regarding the value of all trees, no matter how lowly their origin, and how to see and release the potential in “lesser” trees. All three trees were raffled at the end of the night. Early in the process of styling the shimpaku, Chris was asked if maybe more trimming should be done before the wiring was begun, and a lively discussion ensued. In the end, Chris pointed out that wiring can always be undone, but trimming is irreversible. Tim added that some early wiring of the main branches can be helpful in determining what must be trimmed. 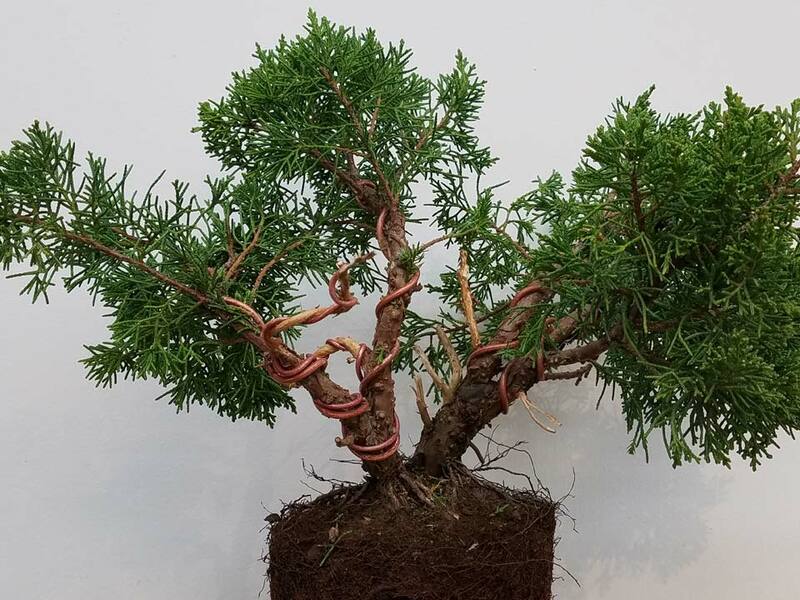 Both agreed that wiring is typically done before trimming, but acknowledged that young nursery trees being styled for the first time might be the exception to that general guideline. 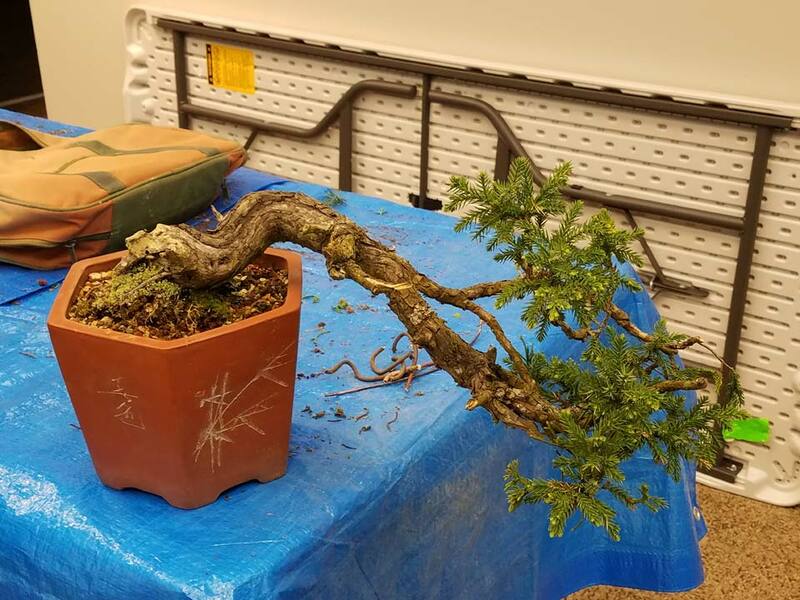 Other tips from the demo: Remember that your tree needs time to recover from wiring. Even if the bending you’re doing isn’t too major, it’s still making countless tiny fractures in the tree’s capillaries, which stresses the tree. Chris also recommends taking photos of your trees, from multiple angles and under the best conditions possible. That way, you can take a close look at your tree as a 2-D representation, which often makes it easier to process and analyze – and style! I heartily agree. I take pictures of all my trees before and after any major change, be it intentional, accidental, or animal-induced. Looking back on the progression of photos gives a new appreciation for how the tree has changed over time, something we don’t always notice since it happens so slowly. One final word of advice Chris gave us at the end of the demo: Don’t be afraid to just do whatever you’re dying to try with your trees. 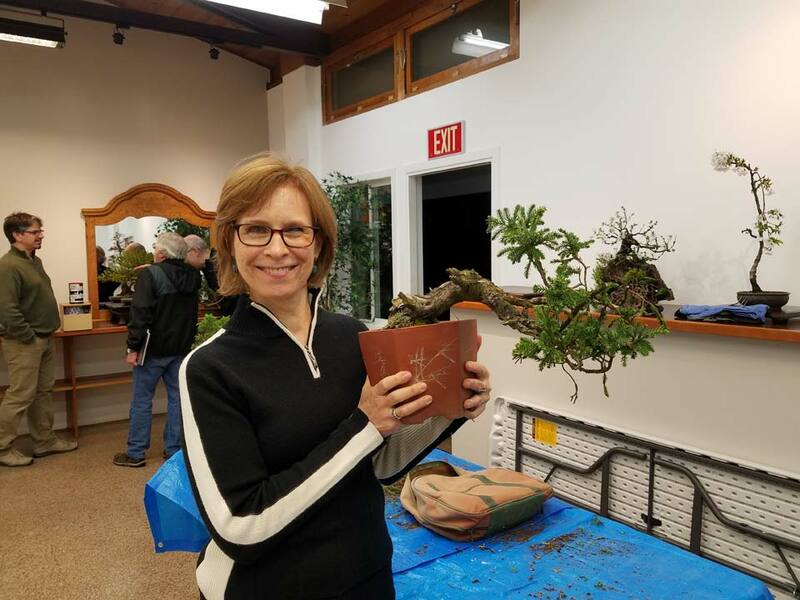 Assuming you’re not trying to learn bonsai for the first time with expensive rare trees, all but the worst mistakes can be fixed with time and patience. Be sure to join us for the workshop on March 21st. 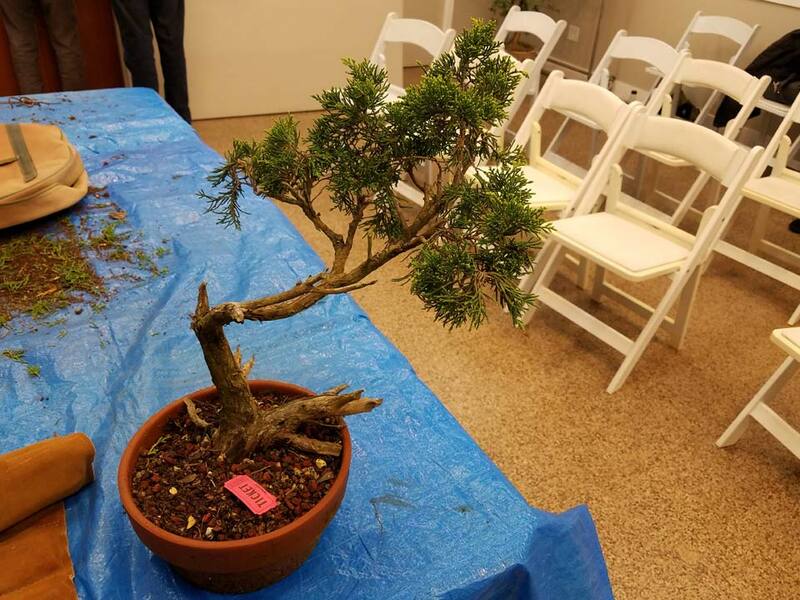 Advanced club members, including Chris, will be available to answer questions and provide guidance regarding the juniper work Chris did during the demo. That will be the priority, but, as usual, other answers and guidance may be given for other tree varieties and situations. Come on down! As of this posting, there’s still time to RSVP, but hurry. Looking ahead, we will be having a presentation from Ryan Nichols on April 4th. Stay tuned for further details about that, and see you at the workshop!